There’s been a lot of chatter recently about the reliability of Twitter’s trending topics and how to make sense of hashtags. Hashtags are words preceded by a “#” which denote what the Tweet is about and makes it easier to search for Tweets about specific topics and events. This weekend’s “Moonfruit” and “GorillaPenis” trending topics on Twitter were examples of trending topics that aren’t easily recognizable and aren’t current events. Personally, I find trending topics and hashtags to be confusing at times because there’s little context surround them on Twitter. And many of the Trending Topics aren’t necessarily breaking news and is often polluted by spam. What The Hashtag is a site launched to solve this exact problem. What The Hashtag provides detailed definitions and context of hashtags and trending topics on Twitter. But what makes the site even more interesting is that it provides hashtag use stats, top contributors to a particular hashtag, real-time hashtag stream monitoring, and charts. 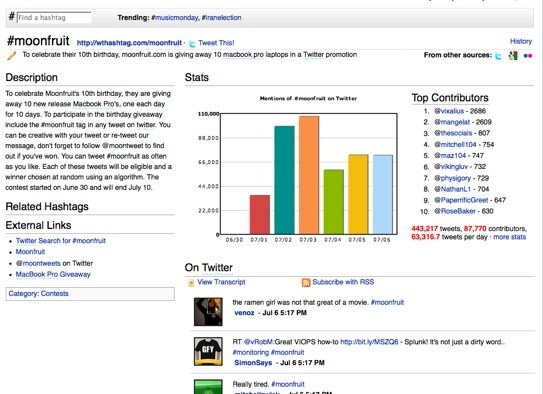 For example, the entry for the hashtag #moonfruit has a graph charting the frequency of the hashtag in Tweets sent out in a given time period, a detailed description of the context behind the Moonfruit, how many Tweets included Moonfruit (443,217) and a real-time stream of Tweets with the Moonfruit hashtag. What The Hashtag reports that it has analyzed and tracked 2,775 hashtags since its launch in February 2009. So far the site has 800 registered users (registration needed for detailed info entry; simple definitions can be submitted without account). The site is adding the ability to Tweet from the site and opening up its API in the near future. What The Trend, which we reviewed here, is a fairly similar service that also makes sense of trending topics and hashtags on Twitter. The two services have many of the same features but a few differences. What The Trend pulls in news stories and photos about trending topics, but doesn’t include some of the analytics and graphing that What The Hasthag offers. It appears that What The Hashtag’s details goes more in-depth with the detailed descriptions and stats, but both sites are pretty useful when trying to make sense of Twitter’s enigmatic Trending Topics.